10 month old Aaron from Country Limerick was chosen as one of four sweet babies to appear on Glenisk packs. You can also meet Abby on our Natural, Micah on our Apple and Pear and Donal on our Strawberry & Apple. More than 4,500 beautiful babies entered our #Sweetbaby competition, so now we're busy trying to create 4,446 new flavours so we can find room for them all on our pack! If you have a suggestion for a new flavour of baby yogurt, or you'd like to send us a picture of your own sweet baby, we want to hear from you. You can also sign up for our free newsletter, full of news, recipes, parenting articles, offers and competitions. The term Bio is reserved exclusively for Certified Organic products under EU law*. Our Baby Yogurts contain only naturally occurring milk and fruit sugars - from organic fruit and organic milk, from well cared for cows, grazing on lush Irish pastures, untouched by synthetic fertilisers or pesticides. We add no sugar and nothing artificial, because our babies are #sweetenough and they deserve better. 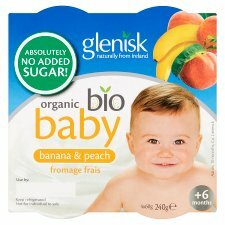 Glenisk Bio Baby Yogurts contain only ripe and juicy organic Bananas & peaches and organic milk from well cared for cows, grazing on lush Irish pastures - Nothing artificial and absolutely No Added Sugar, because we believe babies are #sweetenough. Our children depend on us to make good choices for them. As parents, we have to both the ability and the responsibility to influence their relationship with food now, to help support their lifelong journey to health and wellness. Too much sugar, introduced early, can condition a baby's palate towards a preference for sweet foods. At Glenisk, we believe that those of us who make food for children have the opportunity - and the obligation - to make it a little easier for parents by developing healthy, tasty, nutritious foods that don't take shortcuts.